You’re probably not surprised to learn that money is a top cause of relationship stress. But you may be under the impression that earning more would solve your issues. After all, with more money, you’d worry less about what you’re spending! Unfortunately, having more money doesn’t necessarily reduce stress over it. But if that isn’t the answer to reducing friction between partners over finances, what is? The answer is honesty, communication, and planning. Talk about your financial practices. The way people interact with money and feel about it is incredibly personal and individual. It’s tied to how we were brought up. Maybe you hoard every penny and your partner is a spendthrift, or vice versa. Or you both have issues overspending – or saving every dime and never doing anything fun because of it. Whatever tendencies you and your partner have, you need to have a conversation about them so both of you know where you stand. An expense that seems unnecessary to you may be important to your partner. Listen to where the other person is coming from. Work together to come up with a plan. Financial tension in relationships tends to come from people who act like they’re on two solitary islands, doing whatever they want. Unless you agree to completely keep finances separate, you need to work together. Sit down and create a budget. Be honest about what money you have and how you’re going to spend it. Come up with joint (and individual) goals, and create a plan that enables you to live within your budget and work toward those goals. Sacrifice when reason and logic dictate it. When you’re with someone over the long term, circumstances change over time. There’s a good chance that one or both of you will run into financial struggles at some point related to the loss of a job, medical problems, family needing help, or another unexpected issue. This is part of the deal you make when you decide to be with someone, and it’s probably going to require sacrifice on both sides until things (hopefully) return to where they were. 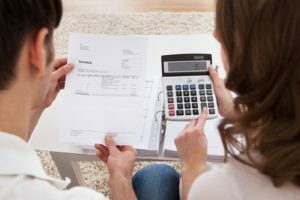 Never lie to your partner about finances. Few things can drive a bigger wedge between couples than dishonesty. Lying about money is often particularly devastating. Imagine struggling to pay bills only to learn that your spouse has a secret account tucked away. Or wondering where your money is going… and finding out they have a huge debt they didn’t tell you about. Honesty is always the best policy. And if you’re on the receiving end, remember to practice understanding and kindness when your partner shares unfortunate financial news. Don't allow yourself to stay stuck with unresolved financial issues. Consider talking with a financial advisor or a Delaware couples therapist to get the ball rolling again.